I have a pork loin roast recipe site/blog. It pretty much covers recipe related stuff. Too many chiefs, not enough Indians. Ocean Life Bracelet A whimsical tribute to the sea. Cut is a funny word when it comes to budgets. It rarely happens. Do you by any chance mean that the rate of growth was lowered from what it has been in recent years. I find it interesting that you just make the claim with no link or reference. My guess is that you read it on one of those kooky websites you have listed whose vocabulary is limited to two words: blame Bush. One thing I haven't seen mentioned is the National Guard. On TV I saw members of the National Guard driving in from elsewhere. How many were there locally? Bush has sent so many members of the National Guard to Iraq for long stints. I assume there are significantly less National Guard now than before. Has there been adequate planning as to how many members of the guard are needed to handle natural disasters like this? This is of course a very extreme example, but there has never been a year in our history without multiple hurricanes, tornados, floods, fires, earthquakes, etc. I do remember reading about a governor trying to stop the reduction of the national guard force in his state for this very reason. I'm not saying I know the answer to this. Andy? Anyone? Stumbled on your blog...pretty good :-) Keep it up! I think I'm adding you to my list of blogs to check out. For anyone who doubts the impact of Bush's budget cuts on the Southeast Louisiana hurricane protection levee projects, just do some Google research. The 17th Street levee, the one that broke and caused the most damaged, was a work in progress that stopped because Bush cut off funding. Stick your head in the sand if you wish, but facts are facts. As for the Nationla Guard, about 45% of Louisiana's regimen is over in Iraq. Bush has had to pull Guardsmen from all over the country, piecemeal, to help, and it's still woefully inadequate. See, this is the reslt of wasting so much time, money and troops in a totally unjust, unnecessary war. Lastly, glad those of you who've found me like the Blog. Feel free to email me at TheOstroyReport@aol.com and I can add you to my distribution and reader list. I used to live in New Orleans; it's my favorite city, and I'm devestated. IF there had been sandbags available--a very large if--would it have been possible to mobilize every able-bodied person in the city to shore up the levees? Nowadays, it's hard to even get our heads around the idea of the population helping itself. Perhaps most people would have bridled at the idea of working for free. But now they've lost their homes and their city. As you might know, reading blogs can be a dangerous business. One blog I visited actually opened my PC's cd-rom. Others have scripts in their pages that do all sorts of things. God knows what they put on my PC. I use Evidence Eliminator to clean my PC of this "filth" daily. I suggest that you should too for your own privacy and for your PC's safety. I admit it, I sell Evidence Eliminator. I usually sell it for ten percent off. But because you are reading my comment (thank you), I want to give you half off. Just send me an email at info(at)evidence-eliminator-info.com and I'll reply with a special URL where you can get half off. If you search for evidence eliminator 5 in the search engines, you may find other sites like my evidence eliminator 5 site. But you won't get this special offer (smile). Take care, and love to hear from you if you have any ideas to share, or whatever. And I expect many of them, ... will take out their highly justified anger and frustration inside the '06 mid-term elections voting booth. Several scientific analyses of the 2004 presidential election have been published. Written by Ph.d statistical scientists they all say the same thing: the '04 election was stolen by Bush. There has been no rebuttal to any of them. So, if you had scientific proof that Bush steals elections, (and we have) would you believe it then? Why think that the next election will be any less fixed than the last three? Very different blog!! I'll be back from time to time. I have a free test drives Site. It's all about free test drives related stuff. Come and check us out if you get time. Got No Time For This! It was spent: This way! Good job! Going to add you to my roll. Do yourself,and us,a favor by disallowing anonymous comments. Eat a little spinach and swallow this. I don't "Blame Bush" I blame idiots like you that voted for him and continue to regurgitate right-wing rhetoric. To very loosely paraphrase H.L. Mencken, "there will come a day when the character of the occupant of the White House accurately reflects that of the common folk, and we will have a downright moron for a president." It's clear that day has come. TOO MUCH SPAM. DO SOMETHING!!!! Conservatives and Republicans kill people. Simple as that. You're linked from buzzflash.com, thus the additional traffic. "The district has identified $35 million in projects to build and improve levees, floodwalls and pumping stations in St. Bernard, Orleans, Jefferson and St. Charles parishes. Those projects are included in a Corps line item called Lake Pontchartrain, where funding is scheduled to be cut from $5.7 million this year to $2.9 million in 2006. Naomi said it's enough to pay salaries but little else. "'We'll do some design work. We'll design the contracts and get them ready to go if we get the money. But we don't have the money to put the work in the field, and that's the problem,' Naomi said." 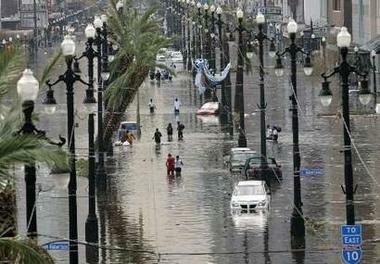 "The Bush administration's proposed fiscal 2005 budget includes only $3.9 million for the east bank hurricane project. Congress likely will increase that amount, although last year it bumped up the administration's $3 million proposal only to $5.5 million. "'I needed $11 million this year, and I got $5.5 million,' Naomi said. 'I need $22.5 million next year to do everything that needs doing, and the first $4.5 million of that will go to pay four contractors who couldn't get paid this year.'" It is horrifying it took bush 4 days to respond! They just decided today to send an aircraft carrier & hospital ships to the area. Notwithstanding the hospital ships will not leave for several days. Meanwhile how long will it take for the aircraft carrier to even reach the area! There is so much that could have been done, should have been done, but wasn't! But at least bush is on spot now, hopefully! Why weren't ships sent immediately; where are the National Guard (oops they are fighting in Iraq); why weren't buses sent to the area to evacuate the residents before the hurricane hit; why weren't enough troops, police, law enforcement sent to prevent the looting; why did bush send Canadian disaster teams back to Canada? Early in 2001 bush received his PDB with FEMA's report that identified 3 potential catastrophes likely to hit the US: 1) a terrorist attack on NY 2) an earth quake in San Francisco and 3) a hurricane in New Orleans. A lot of this could have been avoided if they had not cut funding to raise the levees, but even just raising the levees may have not prevented the flooding nonetheless it surely it would have alleviated at least in part some of the damage. Bottom line: while the bush administration ignored basic domestic federal programmes by diverting money to HLS, Iraq war & major tax cuts citizens now have a clear and vivid picture of the consequences from the reduction in basic domestic safety programmes. Perhaps now our legislators will grasp the magnitude of importance for pre-planning and taking preventive measures. Shelling out money before disasters happen costs less in the long run and more importantly saves lives. Will they learn the lesson this time or will we have a repeat ... if so how many more times will the public accept more of the same?! The blood of the people of New Orleans is on George Bush's hands. "Budget cuts haven't made disaster preparedness any easier. "Last year, FEMA spent $250,000 to conduct an eight-day hurricane drill for a mock killer storm hitting New Orleans. Some 250 emergency officials attended. Many of the scenarios now playing out, including a helicopter evacuation of the Superdome, were discussed in that drill for a fictional storm named Pam. "This year, the group was to design a plan to fix such unresolved problems as evacuating sick and injured people from the Superdome and housing tens of thousands of stranded citizens. "Funding for that planning was cut, said Tolbert, the former FEMA disaster response director. 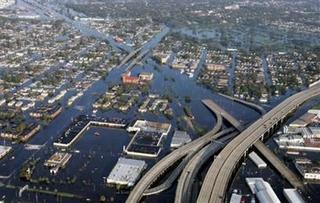 "FEMA wasn't alone in cutting hurricane spending in New Orleans and the surrounding area. "Federal flood control spending for southeastern Louisiana has been chopped from $69 million in 2001 to $36.5 million in 2005, according to budget documents. Federal hurricane protection for the Lake Pontchartrain vicinity in the Army Corps of Engineers' budget dropped from $14.25 million in 2002 to $5.7 million this year. Louisiana Democratic Sen. Mary Landrieu requested $27 million this year. "Both the New Orleans Times-Picayune newspaper and a local business magazine reported that the effects of the budget cuts at the Army Corps of Engineers were severe. "In 2004, the Corps essentially stopped major work on the now-breached levee system that had protected New Orleans from flooding. It was the first such stoppage in 37 years, the Times-Picayune reported. "'It appears that the money has been moved in the president's budget to handle homeland security and the war in Iraq, and I suppose that's the price we pay,' Jefferson Parish emergency management chief Walter Maestri told the newspaper. 'Nobody locally is happy that the levees can't be finished, and we are doing everything we can to make the case that this is a security issue for us.'" It's not enough for the rabid right to redefine words and phrases such as "classified," "ethical," "disclosed," "fired," and, my current favorite, "take out." No, now they have to redefine the word "cut." Well, Popeye, when the man said "cut," he meant "cut." Here's a link to the same information from the Chicago Tribue. I'd get the same from the Wall Street Journal for you, but I can't stand the thought of paying a subscription fee to a right-wing journal. And of course, you'll probably never see this at all on Fox Spews. You said "And I expect many of them, whose increasing disenchantment with Bush and the GOP-controlled Congress is reflected in the dismal 38% approval rate, will take out their highly justified anger and frustration inside the '06 mid-term elections voting booth"
Even if people think they have something to vote against, they need something to vote FOR. What in the world do Dems have to offer? The stance "I don't have any solutions, I just know how to criticize" won't fly.